As much as I love rice, I just can't eat it on Thanksgiving day. Instead, I would rather carb load on mashed potatoes and dressing. 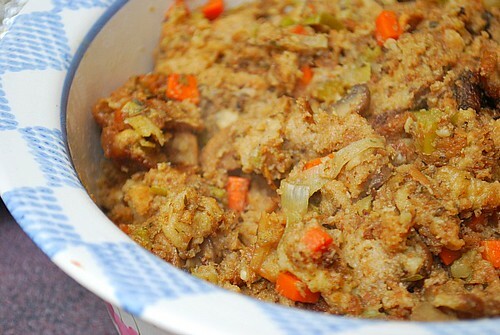 In fact, dressing (or stuffing) is one dish I want to make throughout the year but I just can't seem to do it. Maybe this coming year I'll make it as a side with roast chicken or turkey... since it doesn't have to be enjoyed only on Thanksgiving, right?! This dressing is chock full of vegetables and fresh herbs... it's really flavorful and so, so easy to make. Forget those boxed mixes. You probably have all the ingredients in your pantry to make it from scratch! 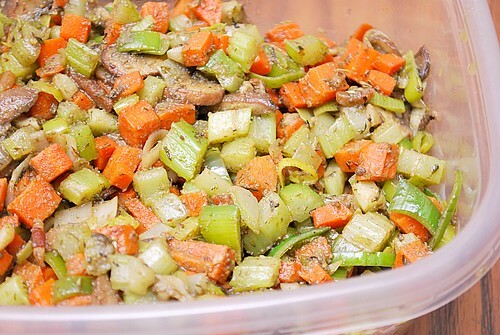 Dressing or stuffing is easier thank you think to make. 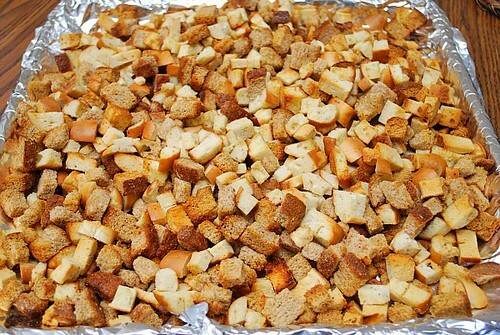 Essentially it's toasted or dry bread cubes, a liquid (like broth) and some seasonings. Anything in addition to that such as vegetables, herbs, nuts, protein, etc is just a bonus. 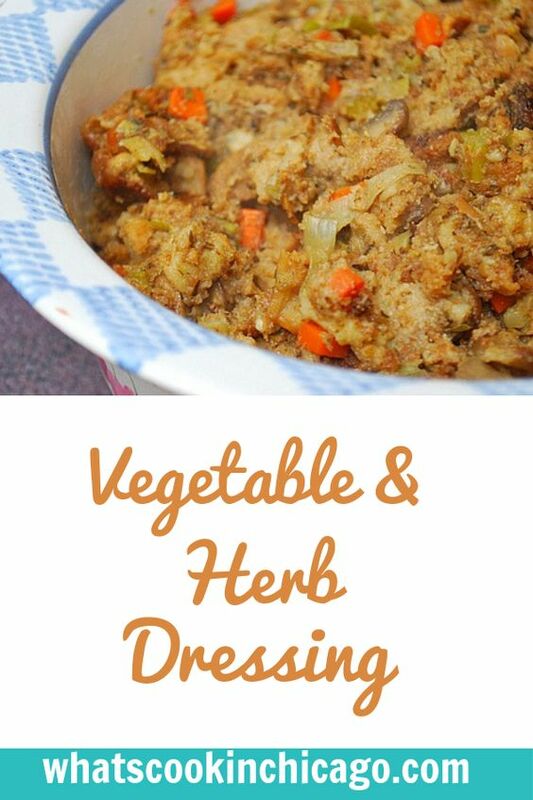 For this dressing, I used some bread I already had on hand in the freezer. Some plain mini bagels and a loaf of whole wheat bread provided a great texture, flavor and contrast. You can certainly use any kind of bread you have so feel free to adapt and substitute where you'd like. To add additional texture and flavor, I sautéed some vegetables including onions, garlic, carrots, leeks, celery and mushrooms. I chose not to include any sausage but that's also another addition you can include... bacon works just as well too! 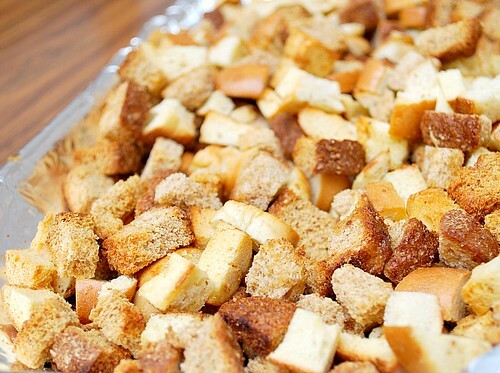 Place toasted bagel and bread cubes in a large bowl; set aside. Press SAUTE and add 2 tablespoons olive oil to IP. Once hot, add the onions, garlic and carrots. Sauté until softened. Place casserole dish on trivet. When the IP beeps after pressure cooking for 5 minutes, turn the setting on top of your IP to VENTING. Doing so allows the IP to quickly release any remaining pressure (also known as QPR or QR). I use a wooden spoon to carefully turn the setting to avoid close contact with the potential steam. You may also want to turn your IP away from cabinets to allow the released steam to escape freely. The pin at the top of your IP will drop when all pressure has been released and it's safe to open. Remove casserole dish from IP and transfer to serving dish.